Have you read Dave Carroll's Facebook's Privacy Problem with Parents? I'm not going to paraphrase it here, because Prof. Carroll does a very able and thorough job explaining why this is so dangerous and alarming. Read it! I left the Facebook platform because I was unhappy with the way they used private medical data gleaned, not from public posts, but from private messages between FB users*. Anyway, now I wonder if I should leave Instagram. * It's difficult to find the news stories that criticize FB practices. FB likely pays a lot of money to make sure those search results appear far, far down--or disappear altogether. First, you need to harvest some snow. 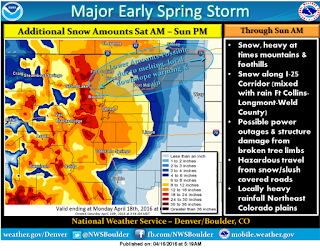 The NWS predicted rain Friday night turning overnight to snow. 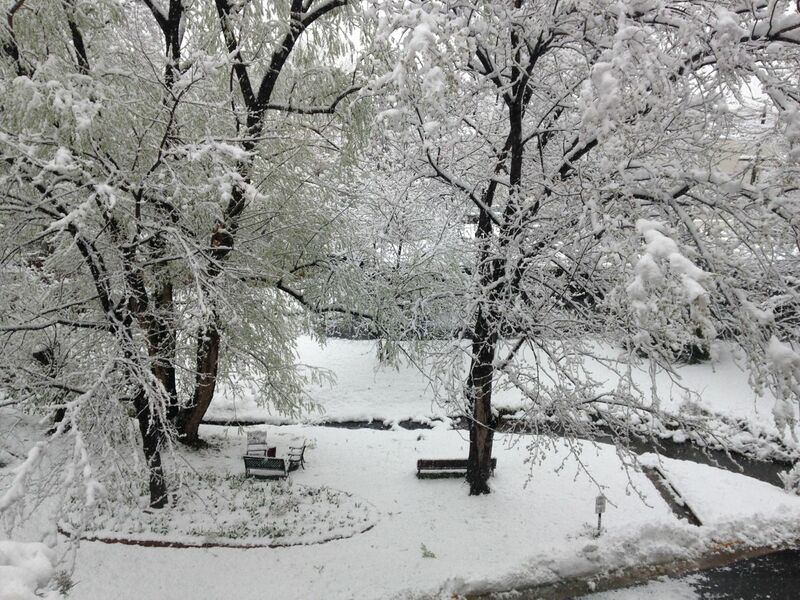 When I woke up Saturday morning, the snow was still melting immediately when it reached the warm ground. When the snow began to stick, I set my IKEA Torkis baskets outside to harvest some snow. 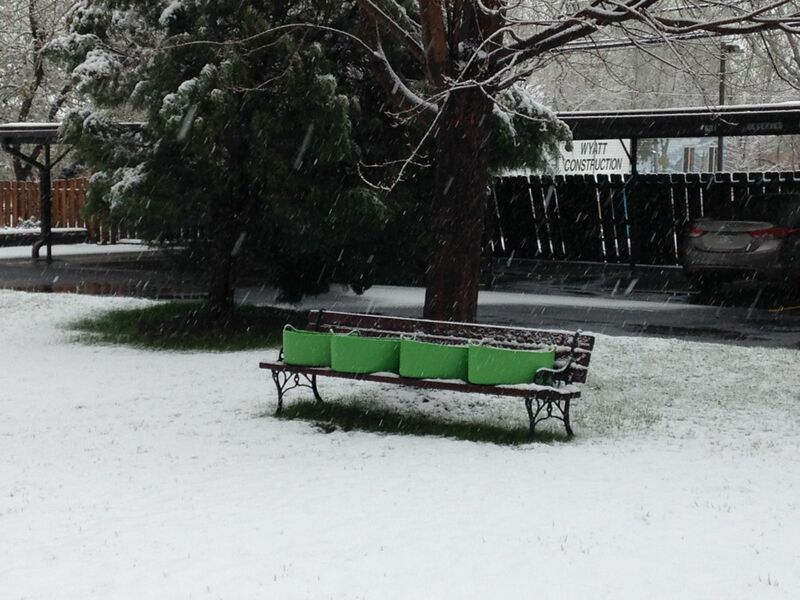 I put them on a bench, so they would equilibrate to the air temperature instead of the ground temperature. 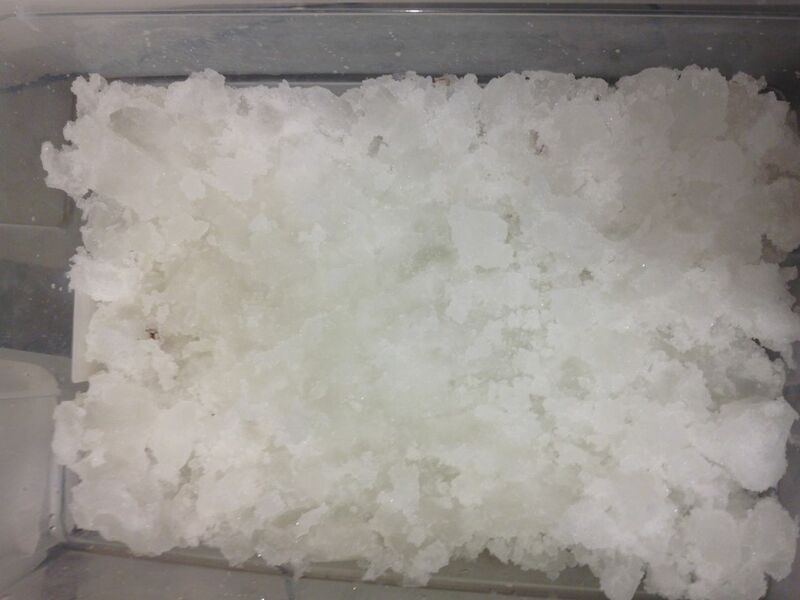 Then I went back inside to mix a cup of soda ash with 5 gallons of hot water. 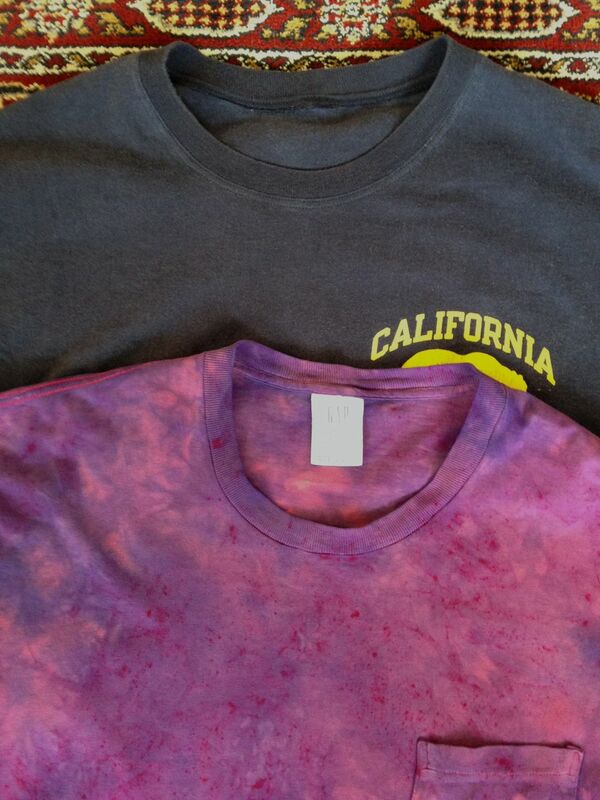 I soaked the four items I wanted to dye in the soda ash solution. Meanwhile, outside, the air temperature remained stubbornly right above freezing. My snow yield was disappointingly low compared to the dead leaf yield. I moved the Torkis to a more open area on the grass. 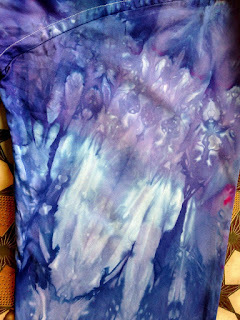 Back inside, I put the scrunched up the damp clothing in plastic bins, mixed some Procion fiber-reactive dyes with water, and splashed the dye in. 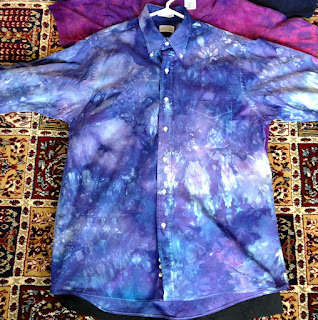 Note that I did not put the shirt on a rack to suspend it above the dye as it drips through. I wanted a more solid look. 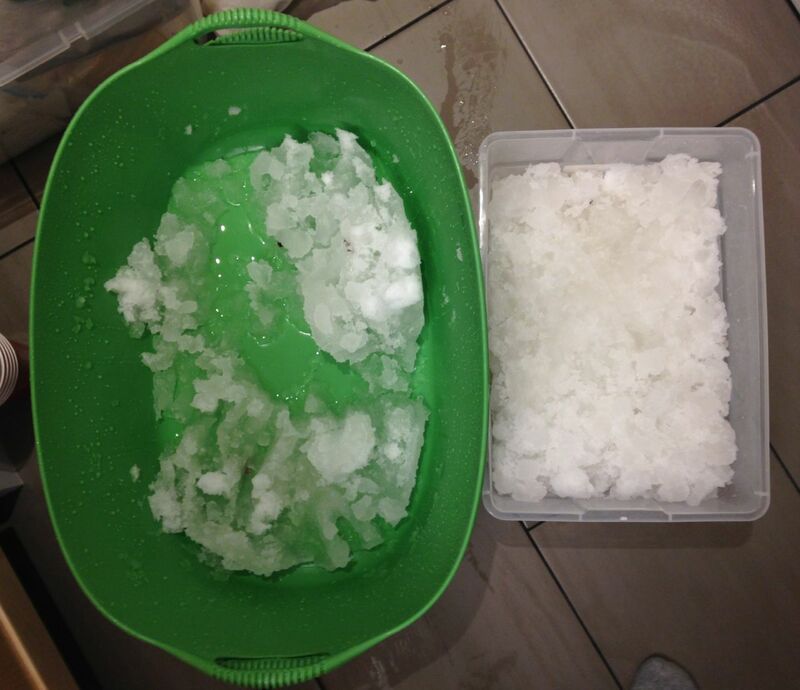 My total snow harvest was pretty pathetic. I consolidated all four baskets of slush and barely had enough to cover the shirt. 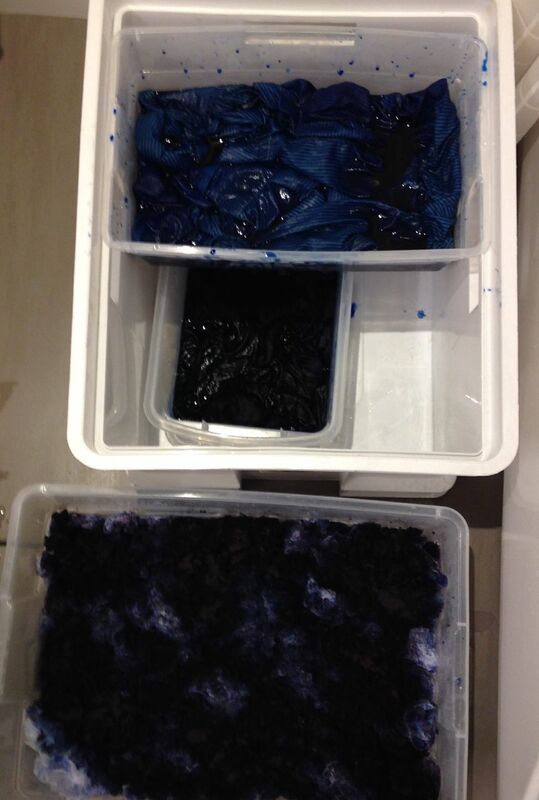 I sprinkled one teaspoon each of midnight blue and strong navy Procion dye powder on the slush/ice/shirt tostada. Waiting inside, catching up with my mending pile. Waiting on the other side of the condo, enjoying the quiet beauty of a snowstorm. Silence in the heart of the city. 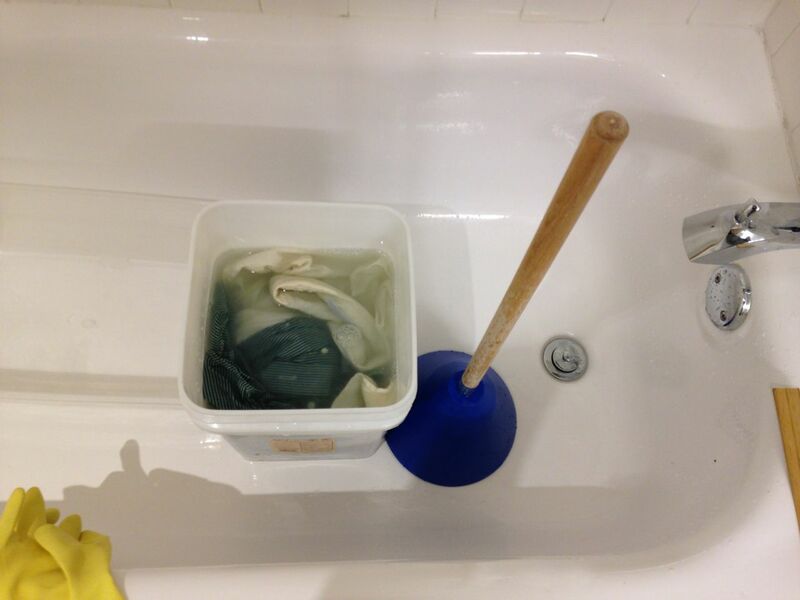 Sunday morning, I rinsed out the clothes until the water ran clear. 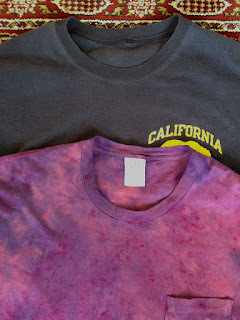 In LA, I use the spin cycle of my washer to extract the moisture (with the excess dye). That cuts the time and water required for rinsing by a huge amount. 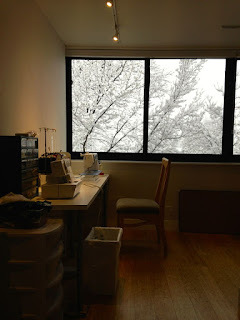 In Boulder, I use a Nina Soft Spin Dryer, which is a centrifuge for fabric/clothing. I am a total snow dye convert now. 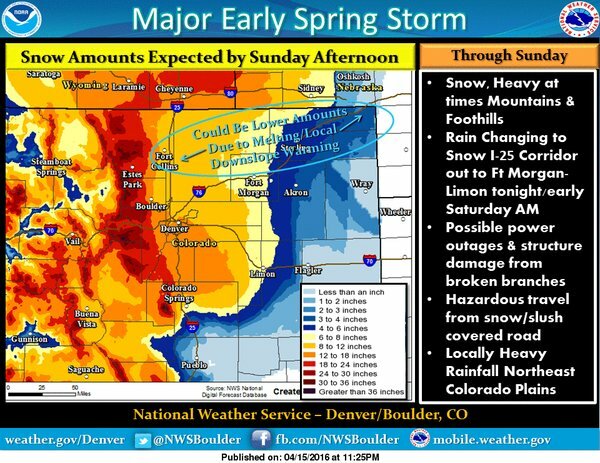 The NWS nailed the forecast. 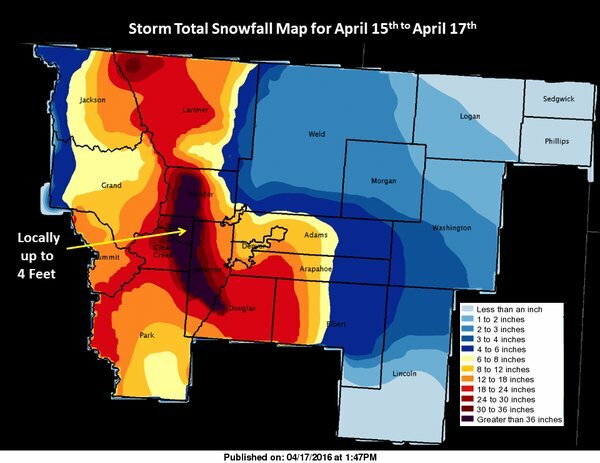 We got an astonishing amount of snow for April. 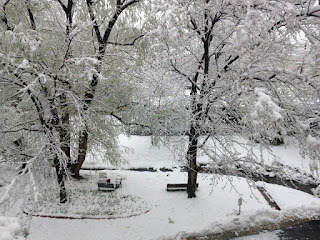 But, most of it fell Saturday night/Sunday morning--too late for my snow dye experiment. I think I will have to learn how to make artificial snow with ice in my blender...and see what happens when I suspend the fabric on a cookie rack. * I have no financial relationship with Dharma Trading except that I've been buying from them for nearly 30 years and have *never* had an unsatisfactory experience with them. 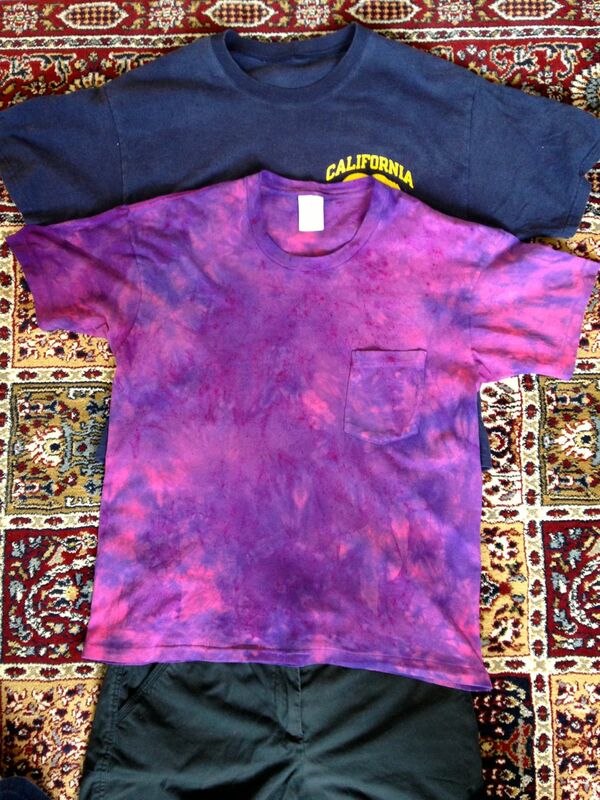 Remember this Dye Magic shirt? I bought it at a thrift store for a song because of a pen ink stain on the front. After a date with Imperial Purple Procion MX dye, you don't notice it. Because the snow/ice storm cancelled my original plans for this weekend, I tried snow dyeing at home instead. I'll show the in-progress photos later. Let's now just admire the end result. I sprinkled a teaspoon each of Midnight Blue and Strong Navy dye powder on the soda ash-soaked shirt, ice, and snow layer cake. One or both of the colors separated into their component colors. I also see flashes of fuchsia dye that did not thoroughly dissolve. I see more snow/ice dyeing in my future. I just have to display enough discipline to use one color at a time until I understand how the colors behave with this method. The weekend is almost over and I did not sew a single item from scratch. But, I did clear my mending pile. The purple T was a hot pink T in a former life. I think I bought it at the Gap on the corner of Bancroft and University avenues, when I was an undergrad (?!?). It's probably from the late 1980s because the tag says that it was made in the US, and the construction was done without shortcuts. If you've read Sew Fast, Faster, Fastest (SFFF), then you know what I mean. I wore that shirt a lot, and it held up very well. One day, it encountered a pen. Can you see the pen ink stain? Scrunch dyed in a plastic shoebox with cobalt blue Procion MX. My basic recipe. I bought the navy shirt later. The tag said that it was made in Mexico, so it was probably made in the 1990s. The shirt may have been made in a medium-wage country, but it was made very cheaply. 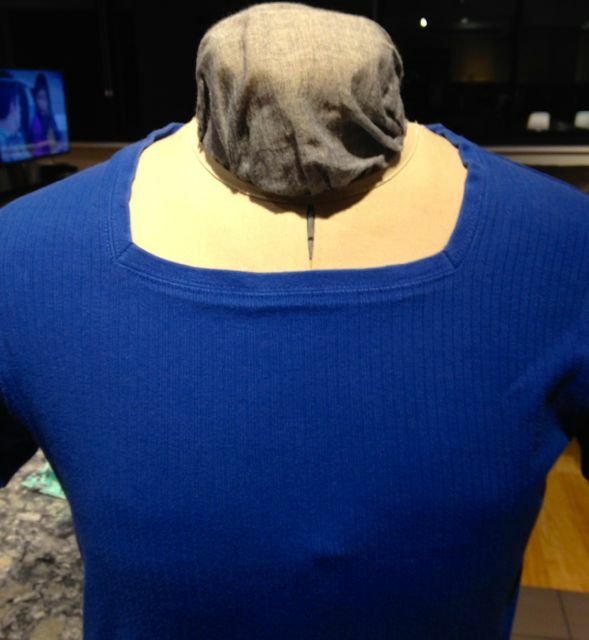 That is, the right shoulder was sewn first, then the neckband was sewn in flat. Finally, the left shoulder and neckband was sewn in one step. That's the fastest method explained in SFFF and one I would never use in my own grandma sewing. This left a scratchy lump at the left neckline that caused red welts on my skin every time I wore it. A snowy night, binge Netflix, and I ripped out the neckline and redid the neckline the right way. 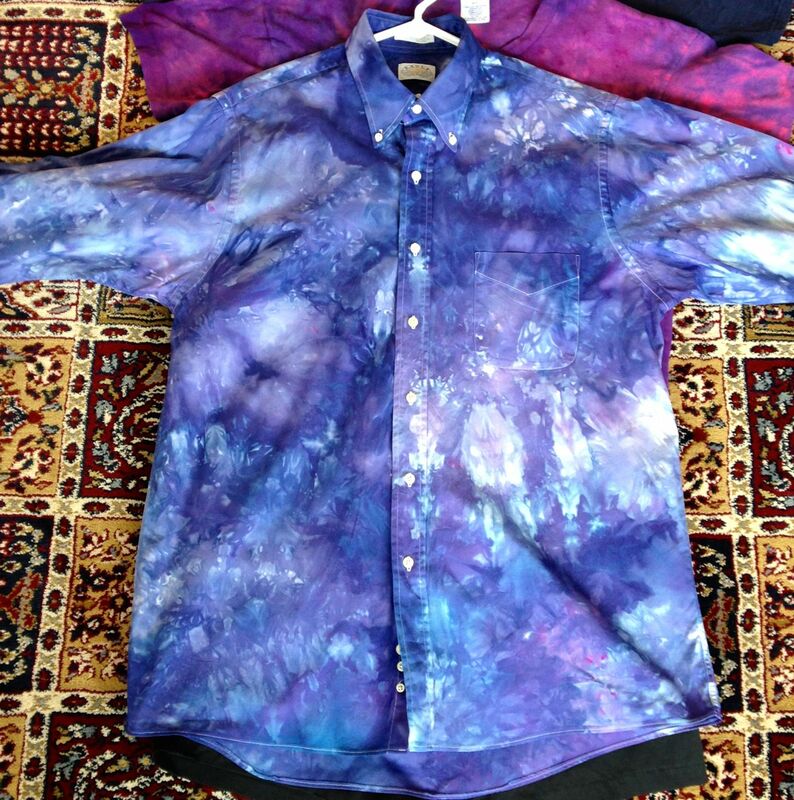 I also shortened the unisex shirt and curved the side hip as shown here. Astute observers may notice that there are three items in the first picture, but only two saves. I rarely wore the black shorts. I thought it was because of the (too long) length. But, after I shortened it, I realized that I still don't like it. 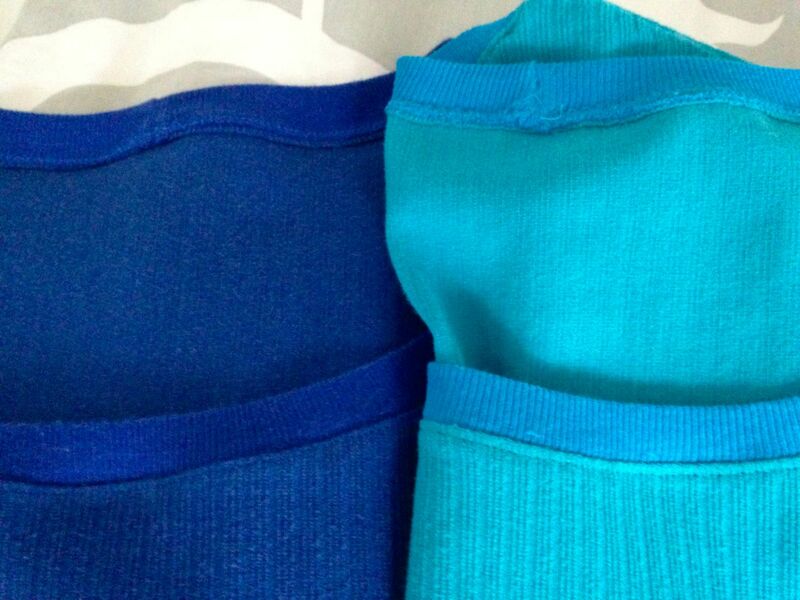 Slim-fitting longer shorts may be elongating, but they are not comfortable. I like my shorts roomy enough for sitting and bicycling. They are in the outbound box. As I went though my mending and refashion pile, I noticed a progression. I could see the increase in construction short-cuts as manufacturers tried to produce in the US, then MX, then central America. But, China could beat them on quality for the price because Chinese wages allowed them to take the extra time. Now China is too expensive and clothing manufacturing has moved on to the next low-wage haven. I don't want my clothing's country of origin tags to be an atlas of human misery and ecological destruction. That leaves welts on the soul. We can't compete on price. We have to compete on quality in a broad sense. That means taking into account the external costs of our economy, ecology and fairness. Fashion Revolution Day is actually the week of April 18-24 this year. Be curious about #whomademyclothes. Years ago, I was a data analyst and subject matter expert. Now that Data Scientist is the job description du jour, I rebranded myself. Rebranding really works. My online resumes generated a lot more views, though I remained substantively the same person, with the same skills, education and experience. Anyway, my pet peeve is how fixated interviewers are about how much data you've crunched, instead of how well you did it. I really, really, really like my job as a data specialist and educator. In case you wonder why a forty-something married mother would move away from her family for a job that barely pays enough to run a second household and fly home, I thought I would show you a sample of my work. 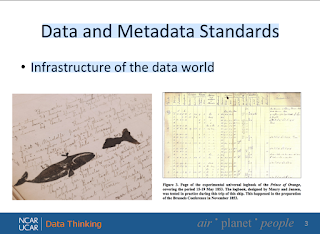 I posted my slides and notes for a recent talk, Data Thinking Before Data Crunching, given to a mixed audience of students, working software developers and scientists-data providers. I help people use data optimally with the (IMHO) most pressing big data use case facing the world--weather and climate. It's a good thing that the computer-based work (and my management) allows me to work from my LA home part of the time. Before I read about Wardrobe Refashion, I used to fall for "bargains" that weren't really bargains. I can't believe that a Buy One Get One (BOGO) promotion lured me to buy not two, but four square-necked t-shirts. The neckline on all of them was always wonky. Perhaps the reason why I didn't previously own any square-necked t-shirts was because they don't suit me? Or that the necklines don't lay smoothly? 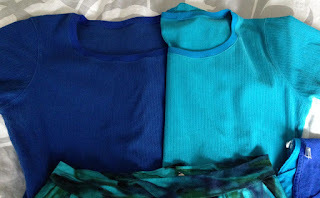 Two t-shirts in my refashion bin donated their neckbands to the cause. Plus, I have turquoise and cobalt fabric to recycle into a future color-block shirt. Two instant tops that go with my new skirt! The colors work really well with my latest skirt, Vogue 9951. A better look at the color (mis)match. I used only my regular sewing machine. (I find serger thread at the shoulders and neck uncomfortably scratchy.) There was a little bit of stretching/buckling, but a steam iron took care of it. I steam-pressed the necklines into smooth submission. I'm spending the weekend inside, wrapping up WIPs for both work and home. 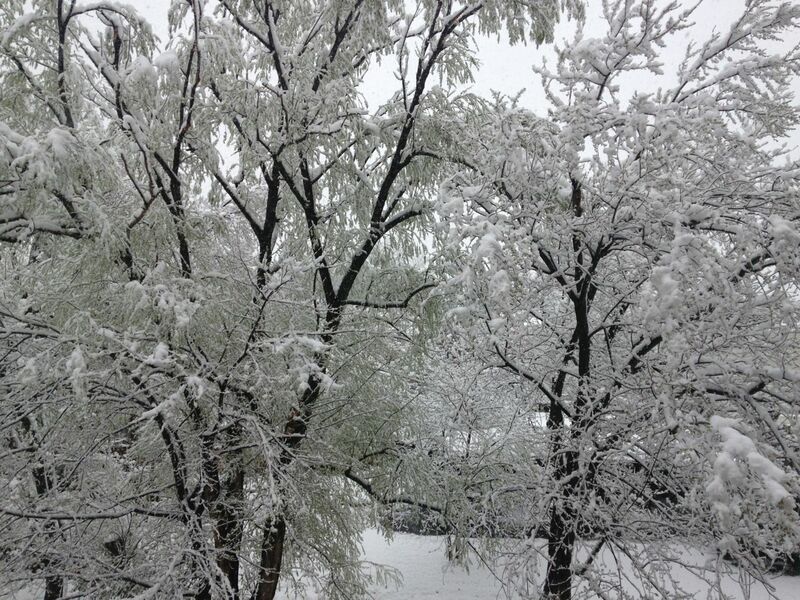 Can you believe the amount of snow predicted for this April storm? 12-18 inches, AGAIN. I decided to make lemonade with lemons. I'm going to experiment with snow-dyeing. Stay tuned. 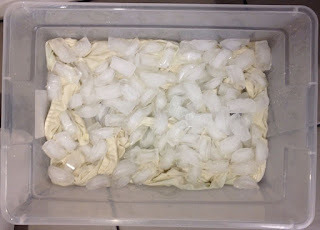 Update: Carolyn wrote about pattern collecting today! I also added an addendum about SABLE at the bottom of the post. 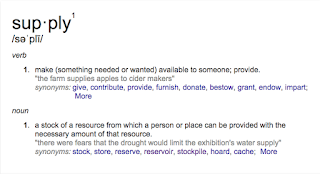 Fabrikated asked, Are you a Hoarder? When I was employed by a major pattern company years ago, I learned a very important piece of information that I never forgot. Pattern companies don't sell patterns; they sell dreams. 75% of patterns purchased never even get opened by the person who purchased them. Look in your own storage, and tell me I'm not wrong on this... right? 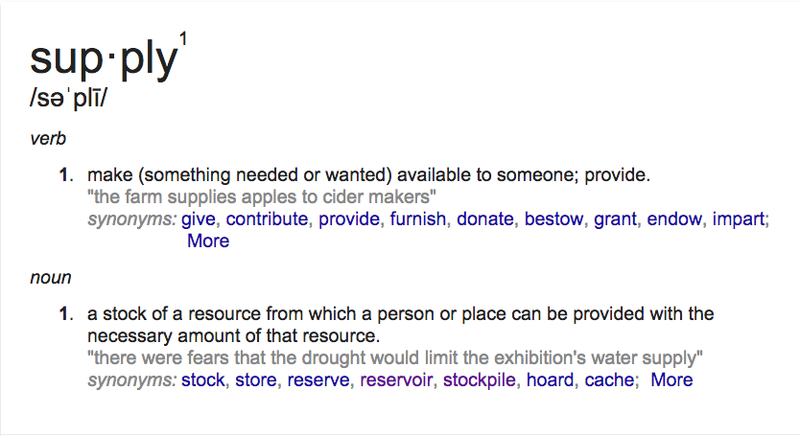 I've read perennial discussions about whether sewing supplies are a stash (which implies something secretive and shameful) or a collection or a resource center. I don't like the connotation of stash, but was looking for a shorter name. I think I'll just call it all supplies. I don't make a secret of my sewing supplies. I've shown my pattern collection. I gave a tour of my sewing space in LA. I keep a lot of supplies and inspiration for making stuff around. It reminds me of something an anthropology grad student in my PhD dissertation support group taught me. (Yes, I went to one the last 6+ months of grad school and found it useful.) PhD dissertations often have vernacular titles, either as the primary title or as a subtitle. The anthro student's subtitle was "Life on the Res" (short for reservation). He unpacked the meaning of what outsiders see on the res and what the people who live there see. He gave me an example of how he needed a part for his very old domestic car. The part was no longer made and he didn't have the money for a new (used) car. His uncle told him not to stress too much over it. Most people on the res kept old, inoperable cars scattered around their homes. To outsiders, they look like trashy eyesores. His uncle took the student on a tour of the res, visiting with people, and asking if they had, or knew of anyone who might have the part he needed. In one day, they had the crucial part and some other parts that could also be useful. Those old cars are not eyesores. They are supplies. If you follow my link above to the tour of my LA sewing space, you will see how I save old clothing and scraps of fabric bought by the pound from odd jobbers. 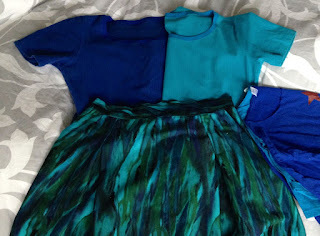 When I want to make something, like this coordinated set of spring clothes for my daughter, I peruse the collection and pull supplies. When you become known as someone who makes new clothes from old, old textiles potential finds you. I have a couple of bins of potential in both homes. ;-) You can see more of these projects under the Wardrobe Refashion tag. I also have bins of new fabric in both places. 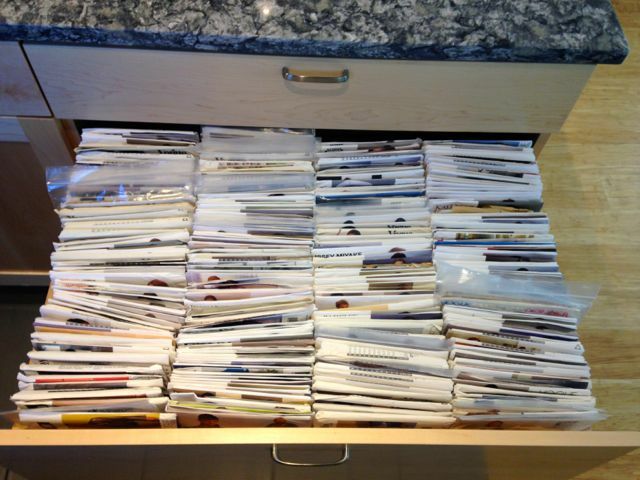 Most of my books and all of my patterns reside in Boulder. I open and read all my patterns. I've sewn with less than 25% of them. However, I have made more than 25% as many items as the pattern count because of repeated use of TNTs. I customize TNTs, informed by what I learned from reading other patterns. I like to read pattern directions and look at the shape of the pattern pieces. Sometimes, I measure and compare it to other patterns that I have sewn or RTW. I don't sew the vast majority of my patterns. But, I may take an element or technique from one pattern and use it on another. Do you have to sew an item using a pattern's pieces to make use of it? I buy a few patterns every season. I'm haunted by an Issey Miyake pattern that I did not buy (in the 1980s) before it was discontinued. I can't find it for less than $$$ on eBay (and not even in my size). Also, if I don't support the people who put out patterns that I like today, how will they stay in business? 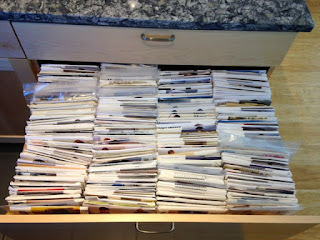 In 2010, I catalogued my patterns and also kept spreadsheets of how much I buy/spend on my knitting/sewing/dyeing hobbies. The sum seems quite reasonable for something that I enjoy, that teaches me new things, and that clothes my family and furnishes our homes. The same goes for fabric and yarn. Local independent fabric and yarn shops are in constant peril of going out of business. Fabric and yarn stores are businesses, not petting zoos. They need to pay rent, staff salaries, and turn over their stock so that they can bring in new stuff. The limiting factor is space. 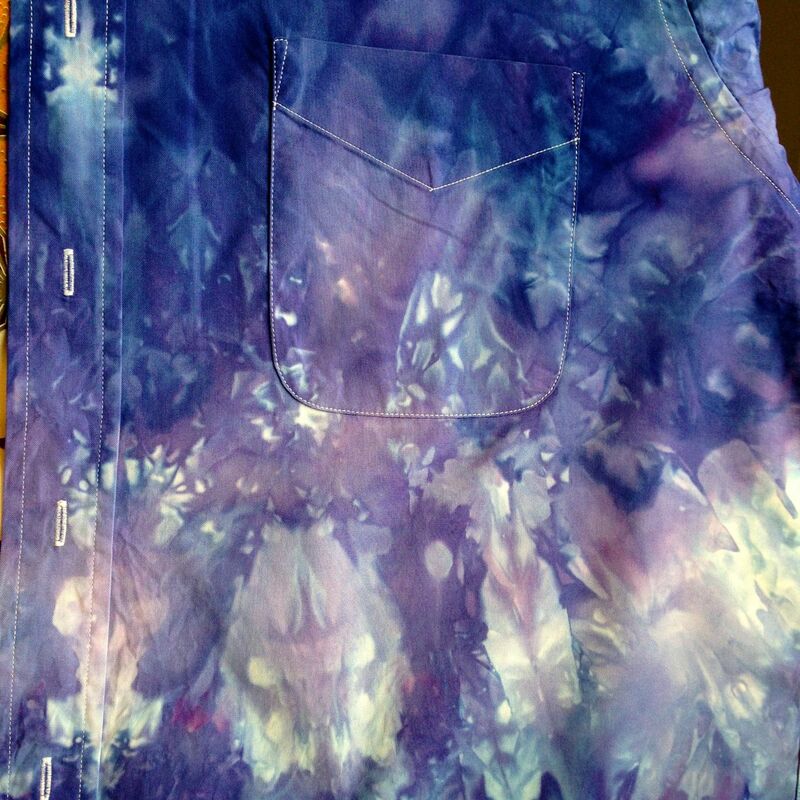 I follow the technique of a sewing mentor. I have a fixed amount of space I am willing to devote to my hobbies. When supplies exceed the space, deaccessioning is required. Over time, her collections of sewing supplies, artwork and furniture evolved so that it now contains only very high quality items. I sort my supplies into bins that I really like and things that I will not be sad to part with. I'm happy to give the latter away to friends (or my daughter's friends) who sew and knit. My collection is evolving, too. YMMV. Everyone has different space and budget constraints. But, let's stop feeling bad about something that should make us feel good, making things with our mens et manus. I don't like the term SABLE for the reason that the S stands for Stash. I expect to be less mobile toward the end of my life, so I want to have plenty of supplies at home when that happens. But, I think it is good to think through how much you can reasonably use in a lifetime and who will take care of the surplus after you are gone. The South Bay Quilters' Guild (southern coastal LA) accepts donations of quilting supplies. Quilt fabrics and battings are used to make charity quilts. Books and notions are sold and the $ from the proceeds are used for purchasing other supplies for charity quilts. SBQG was discovered by funeral directors, who have been referring quilters' survivors. When quilters' survivors reach out to the guild, we accept pretty much the entire collection, sort through it for what we can use, and then forward the apparel fabric to other charitable organizations that can use them. Churches, schools, scout troops and other service groups can all use art and craft supplies. Looking around your local area and leaving a list of places who accept donations of the type of supplies you have, is good estate planning. I've also heard good things about Freecycle. 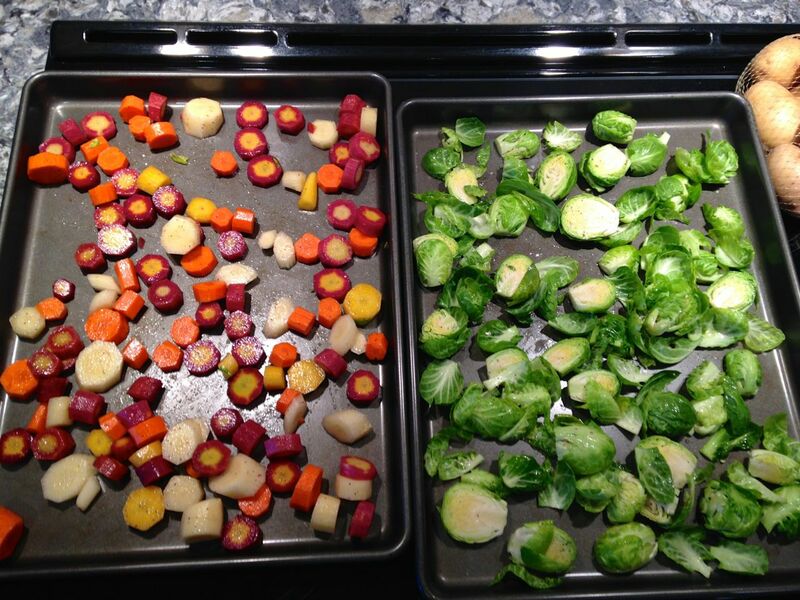 I just love roasted veggies when the weather is cold out. We have LED under-cabinet lights and on the range hood. Actually, we have LED track and can lights, too. They give me a shot of full-daylight spectrum light when I need a winter-time boost. They also provide food photography opportunities. 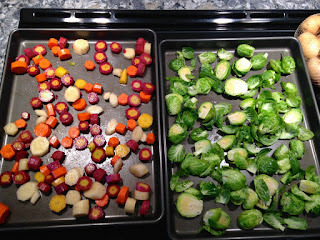 I also cut up the potatoes in the top right corner and roasted them with rosemary from our bush in LA. I always bring CA sunshine to CO in my suitcase in the form of backyard produce. During Boulder's recent heavy snow storms, I worked at home. I work with geophysical data sets, which can be large. My home connection speed seemed soooo sluggish so I ran speed tests with a few websites. The results were all similar. 50 Mbps down and 6 Mbps up is a fast home connection speed. 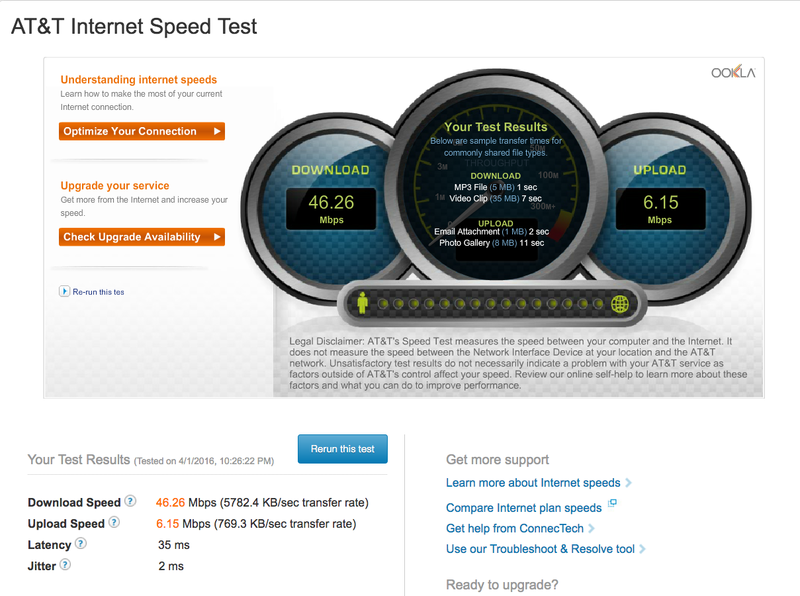 According to Geeksquad, this is about as fast as you can expect at a residence. Why did it seem so slow? I reran the tests at work. 1 Gbps up or down! Happy belated April Fools' Day. 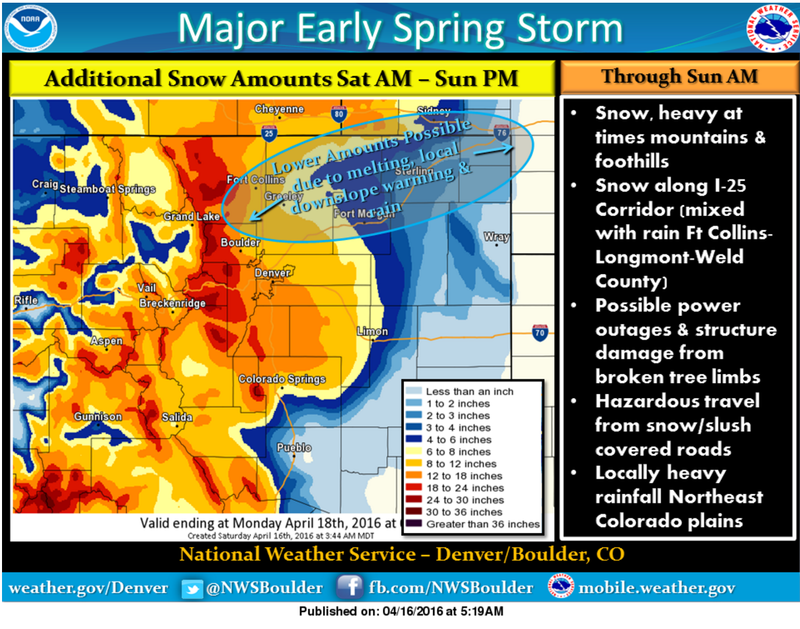 This was my favorite 2016 April Fools' prank, but it's actually deadly serious. Desert tortoise militia occupies Bundy Ranch: Endangered reptiles stage heavily armored takeover of cattleman’s property. Do you remember the pre-internet days? 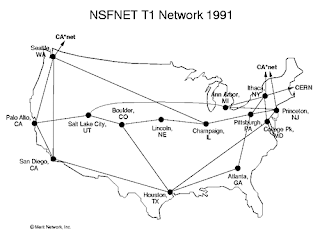 When only a few non-military (ARPANET & MILNET) sites in the country were networked together through NSFNET? 56 Kbps was blazing fast, and you had to sit at one of 6 supercomputing centers to get that. 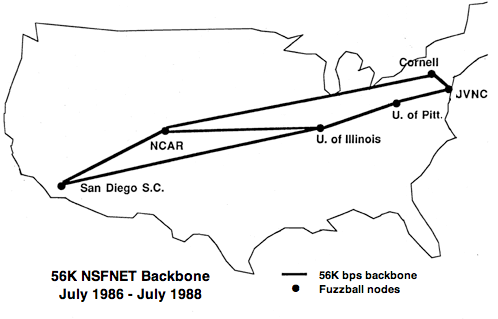 The network expanded and so did bandwidth in 1991. Palo Alto was an upstart compared to Boulder. 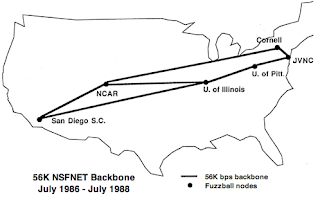 NSF decided to allow anyone who wanted a connection to hook up to their network through NCAR. (This was before the internet and ISPs.) Boulder might have become a tech hub anyway, but this decision certainly accelerated that development. 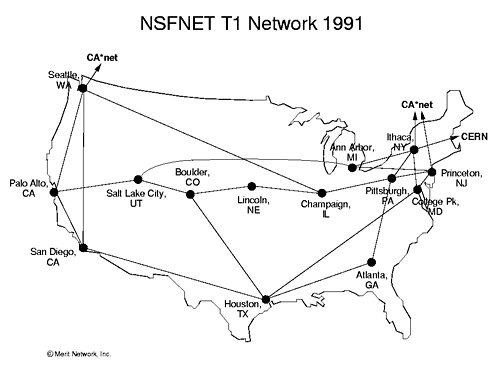 The network was reconfigured with even faster speeds in 1992. Notice that the major nodes were moved to population centers, with spurs to universities and national labs. 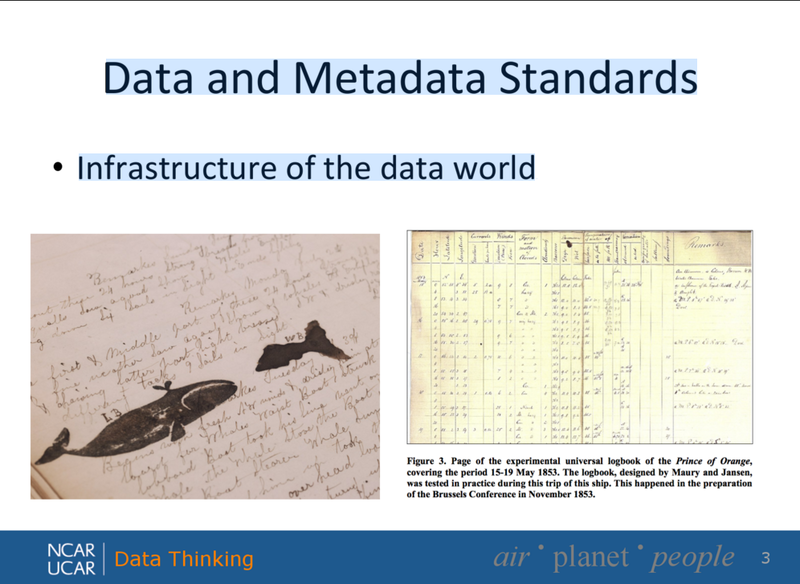 Weather data was one of the original Big Data use cases. And we need a pretty fat pipe to push data out to the world. Working at home, on a standard connection, is a pretty humbling reality check. I need to experience what users outside of major universities and national labs experience. I have helped climate researchers in Madagascar and east Africa, who work within the constraints of very slow network connection speeds outside their local regions. I've also helped researchers studying pollution in countries where questioning the effects of development puts them in personal peril. They are my heroes.